Crazy Food Dude: News: Crazy Food Dude Is A Celebrity! 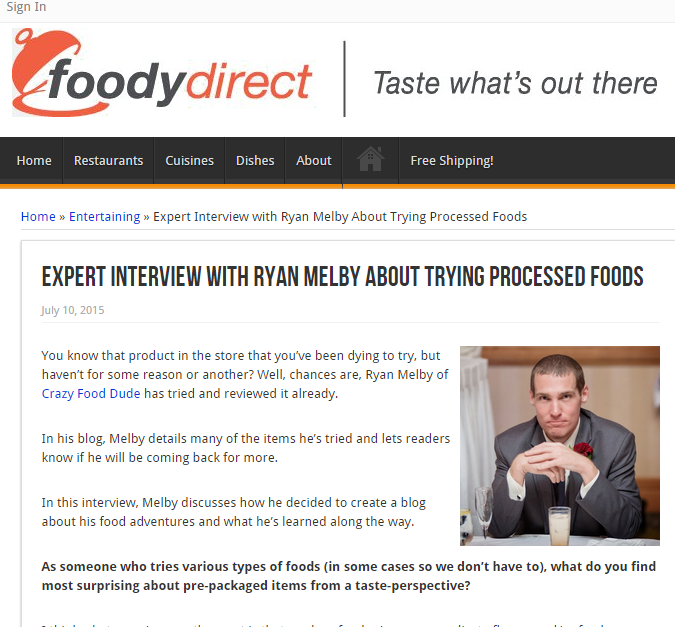 News: Crazy Food Dude Is A Celebrity! 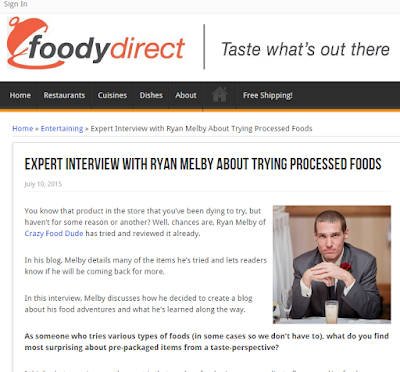 Okay, I'm definitely not a celebrity, BUT I did get interviewed for the blog at FoodyDirect.com and the here is the interview for you to indulge in should you so choose. As a side note, I guess I'm revealing my real name by linking this interview on the blog, but who cares because I'm a celebrity, right? Ha. Congratulations! Great article! It was terrific to meet the "crazy dude" behind the food. I've been reading your blog since the beginning and really appreciate all of the time and effort you put into it. Plus, I love how you mix your wry humor with incredibly informative reviews. Your recommendations have guided my grocery shopping and you've never led me wrong. Congrats, again, and I look forward to many more years of your crazy food reviews! Thank you for the very kind comments, Tracey! Thanks for sharing the link. I agree with Tracey above. I've enjoyed your blog for years. I also agree that cinnamon buns is a great flavor. Keep up the good work! Thanks, Brent! Glad you enjoy it! Trust me, that would not be very exciting. Outside of what I post on here, I eat the same thing every day (vegetables, an apple and pudding). It's REALLY boring. Congrats on the interview! I enjoy reading blogs that are these food reviews. And yours in particular because you are local! Yes, I'm in Indy too (don't worry I don't know you). Thanks for the comment though and thanks for reading the blog! Reading that makes me appreciate your blog that much more - thank you! It's nice to have a review site to go to where we can learn about new 'quick and easy' foods (I really don't care so much about 'processed' either - that can be in the eye of the beholder). We are grateful to you! To do a bad impression of the AT&T Wireless commercial, I appreciate you appreciating me! Thanks! I think that's the first time anyone's ever told me I made a personal connection with them (warm fuzzies), whether through the blog or otherwise. Thank you for the very kind comment!